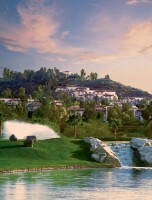 On your next Arizona golf vacation come visit one of the best resorts in Scottsdale, The Westin Kierland Resort & Spa. Located in North Scottsdale's Kierland district, this upscale modern resort is conveniently located next to Kierland Commons and across the street from Scottsdale Quarter. On-site at the Westin Kierland, enjoy swimming, spa, salon, fitness center, three amazing restaurants, and the 27-hole championship course, Kierland Golf Club. Golf is included with your accommodations at any of these nearby Arizona golf courses: SunRidge Canyon Golf Club, Kierland Golf Club, Rancho Manana Golf Club, Legend Trail Golf Club. Package prices are per person and based on double occupancy. All packages are inclusive, with accommodations, golf and all taxes included. Reserve this Arizona Golf Package by calling 1-866-218-6941 or request a free custom package quote. Enjoy luxury at the Pointe Hilton Resort & Spa. Located in North Phoenix, this full service has it all: an on-site swimming park, spa, salon, four restaurants and the Pointe Golf Club at Lookout Mountain. Golf is included with your accommodations at any of these nearby Phoenix golf courses: Arizona Biltmore, Rancho Manana, Kierland Golf Club, and Pointe Golf Club – Lookout Mountain. Reserve this Arizona Golf Vacation Package by calling 1-866-218-6941 or request a free custom package quote.